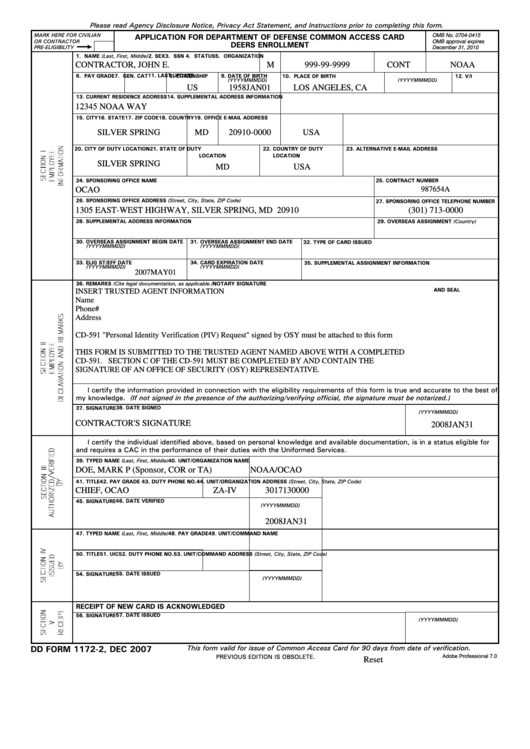 Download a blank fillable Dd Form 1172-2 - Application For Department Of Defense Common Access Card Deers Enrollment in PDF format just by clicking the "DOWNLOAD PDF" button. Complete Dd Form 1172-2 - Application For Department Of Defense Common Access Card Deers Enrollment with your personal data - all interactive fields are highlighted in places where you should type, access drop-down lists or select multiple-choice options. Please read Agency Disclosure Notice, Privacy Act Statement, and Instructions prior to completing this form. SIGNATURE OF AN OFFICE OF SECURITY (OSY) REPRESENTATIVE. and requires a CAC in the performance of their duties with the Uniformed Services. This form valid for issue of Common Access Card for 90 days from date of verification.